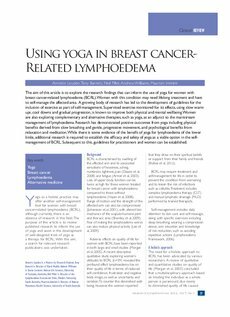 The aim of this article is to explore the research findings that can inform the use of yoga for women with breast cancer-related lymphoedema (BCRL). Women with this condition may need lifelong treatment and have to self-manage the affected area. A growing body of research has led to the development of guidelines for the inclusion of exercise as part of self-management. Supervised exercise monitored for its effects, using slow warm ups, cool downs and gradual progression, is known to improve both physical and mental wellbeing. Women are also exploring complementary and alternative therapies, such as yoga, as an adjunct to the mainstream management of lymphoedema. Research has demonstrated positive outcomes from yoga including physical benefits derived from slow breathing and gentle, progressive movement, and psychological benefits from relaxation and meditation. While there is some evidence of the benefit of yoga for lymphoedema of the lower limbs, additional research is required to establish the efficacy and safety of yoga as a viable option in the selfmanagement of BCRL. Subsequent to this, guidelines for practitioners and women can be established.